It’s nearly 17 years since Jamie Oliver first burst onto our TV screens in The Naked Chef. His approachable, cheekie chappie Essex boy persona was an instant hit, prompting people around the country to rush into their kitchens to recreate his tasty, vibrant food. Jamie’s kept himself very busy in the years since then. He’s built an empire that’s worth an estimated £250 million and he employs an astonishing 8,000 people. He’s published 18 cookbooks, fronted numerous TV shows, was the face of Sainsbury’s and has expanded his repertoire to include high profile food education campaigns. In 2002 Jamie set up the charity restaurant Fifteen in London to give youngsters from disadvantaged backgrounds a leg up the cooking ladder. An MBE followed in 2003 and Jamie was named the UK’s most influential person in the hospitality industry. Jamie’s TV series Jamie’s School Dinners and the resulting campaign Feed me Better highlighted the need for better quality food for school children. His work to raise awareness of the need for proper nutrition proved so successful that the UK government was forced to pledge a substantial sum to help schools replace cheap processed junk food with healthy school lunches. Jamie’s drive and ambition seems insatiable, so he clearly takes his own advice and fuels his energy good quality, nutritious food. 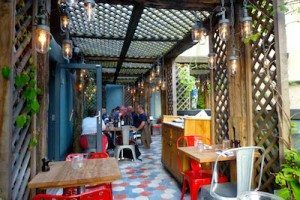 As any Jamie Oliver fan knows, he loves Italian food, so it was no surprise when he focused on that with his first high street business venture in 2008 with the Oxford opening of Jamie’s Italian. There are now branches in numerous high streets around the country, as well as in Ireland, Australia, Dubai, Russia and Singapore. The Brighton branch is in a great location on Black Lion Street. It has a big main dining room on the ground floor that’s buzzy and atmospheric. 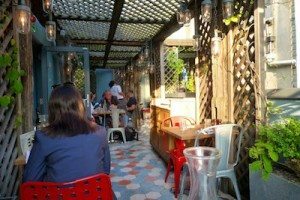 It was a warm summer’s evening, so my friend and I were glad to be seated at a table on the upstairs alfresco terrace, which is a little-known gem. massive space but it’s wonderful nonetheless – wooden trellises with climbing plants and lovely little glass lanterns. It’s romantic and picturesque, reminiscent of somewhere you’d dine on holiday which creates a relaxing sense of occasion. The menu is impressive and includes nibbles, a great array of starters, various pastas and pizzas, some tasty-sounding mains, decent chargrilled steaks and different side order options. I particularly liked the sound of the three ‘planks’ on offer: you can choose from seasonal vegetables, cured meats or ‘Jamie’s ultimate sharing plank’ which includes artisan meats and pates, innovative vegetable dishes, cheeses, pickles and salad for £10.25. After some debate my friend and I plumped for starters from the set list instead of the planks but it wasn’t an easy decision. and the Primitivo Puglia red wine, which tasted like blackberries and was more robust. Both were great suggestions from Matt. 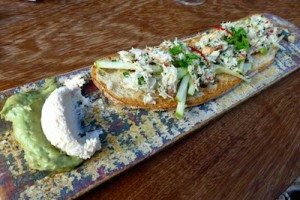 My friend’s starter, the crab and avocado bruschetta, looked stunning and very seasonal – toasted sourdough bread topped with fresh crab and apple with avocado, chilli, mint and lemon (£6.70). She said it was a good summer starter; light and fresh. The apple flavour was quite predominant against the delicate but it added a nice sweetness. 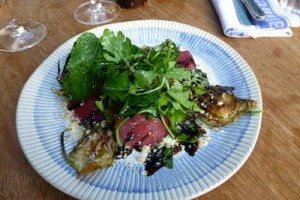 Meanwhile, I had the Bresaola salad, which comprised slices of cured beef, artichokes, rocket, crumbled Colwick cheese, aged balsamic dressing and toasted almonds (£6.00). It was divine; one of the best salads I’ve eaten in ages and I’d definitely have it again. The balance of flavours worked really well, with the slightly smoked taste of the beef set against a more creamy, rich and deep flavour of the Colwick cheese. I love artichokes, so am always happy to have them in a dish, and the almonds brought a good crunch and texture. An excellent starter for a summer meal. For our mains my friend decided to have a pasta dish she’d never tried before and I went for a steak. 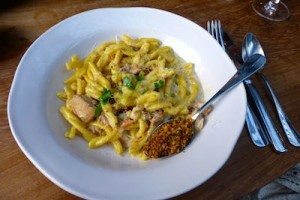 Her choice was wild rabbit casarecce, which was described on the menu as slow-cooked ragù with garlic and herbs, mascarpone and lemon (£6.50/£10.95). 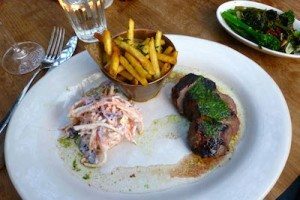 I was advised by our waiter Matt that the best steak option was the rump (£15.95), which comes served with garlic and parsley butter, rainbow slaw and skinny fries. I asked for it to be medium. As a side order we chose Jamie’s ‘Must Try Cime Di Rapa’ (£3.25) – baby Italian broccoli with olives, garlic and lemon butter. Casarecce pasta is shaped like a long thin rolled tube, which is ideal for a heavier sauce. I was expecting my friend’s pasta ragù sauce to more wild rabbit meat based, but in reality it was a bit like a creamy carbonara with a taste of the rabbit from scattered chunks rather than the usual carbonara bacon. It tasted good but was very rich and a fulsome portion, so bear that in mind if you order it. My rump steak had been chargrilled “al mattone” which means under a brick. It was a great piece of meat, cooked slightly over medium but delicious nonetheless. I really enjoyed it, and you can’t go wrong with a classic garlic and parsley butter. The fries were perfectly salted and had the skins on still, which I actually prefer, and the rainbow slaw was a mix of different coloured cabbages and veg in a creamy dressing. It had a tartness that offset the rich hunk of meat. Jamie’s ‘must have’ baby broccoli was also very garlicky, so I was glad to be with a friend! I liked the addition of the olives and the chilli, as the vegetables were then lifted out of the ordinary. To round off the meal on a sweet note, my friend chose the Tiramisù, which was described as “coffee-flavoured trifle with orange mascarpone and chocolate” (£5.25). Tiramisù isn’t usually orange-scented, so that was an extra dimension, and my friend was clearly gravitating to creamy dishes throughout her meal as she reported back that the dessert was richer than she had been expecting. It was very sweet, so would be good for all seasons rather than just summer and would have been a good accompaniment to coffee. We’d had a lovely evening at Jamie’s and enjoyed ourselves very much so were reluctant to depart. As we left the place was still thronging with diners so it is clearly a popular destination. Jamie Oliver has created a restaurant that serves Italian food with the odd twist here and there, so it’s very much as you would expect. Home-cooked style food rather than haute cuisine with a welcoming atmosphere. Worth giving it a go if you haven’t already.